The Council for Community Service and Environmental Development (CSED) kicked off its first meeting for the academic year 2018-2019 on Tuesday, 25 December 2018. 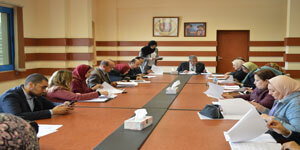 The meeting was chaired by Prof. Ramadan Abu El-Ala, the Vice President of Community Service and Environment Development Affairs. This was held in the presence of Prof. Hisham El Shimy, the Director of the Community Service and Environmental Development Centre, representatives from all PUA faculties and other external members; Eng. Khaled Alsayed, the Chairman of the Board of Alex Fertilizers Company and Major General Waheed Radwan, the President of East Alex District. At the outset of the meeting, all the attendees stood a moment of silence in mourning for Mr. Mohamed Ragab, the founder of Pharos University and the former Chairman of the Board of Trustees. Prof. Ramadan Abu El-Ala showed the attendees a report on all the proposals which have been approved by the CSED Council last year; all of them reflected the real needs of society and were put into force through working in cooperation with some community associations for public work. The Council also approved forming cooperation between the faculty of Arts and Design- Pharos University and the East Alexandria District Presidency to create a mural on the sea corniche for depicting Alexandria City. On his part, the President of East Alex District expressed his content of this cooperation between Pharos University and the Presidency. Then, he promised to refer the students, who have received medical examination on the PUA medical convoys and needed medical care to the Director of the Educational Administration affiliated to the East Alexandria District Presidency in order to gain approval on receiving medical treatment in Pharos University. It has also agreed upon establishing a pharmacy which will only be dedicated for receiving valid medications in order to give them for the needy. Accordingly, a committee was formed from academic staff members from the faculties of Pharmacy and Dentistry, along with administrative staff from the CSED Council; its mission is to draw up the plan of receiving and distributing medications among the needy. Prof. Ramadan Abu El-Ala invited the civil work associations to participate in the workshop organised by the CSED Council and the Training Centre under the title of “The Mechanism of Establishing and Evaluating a Register for the Occupational Safety and Environmental Protection inside the Industrial, Medical and Tourism Establishments and Constructive Works”. By the end of the meeting, recommendations were made to activate the new proposals; a step that will be a credit for the CSED Council and a completion for its achievements during the last years.